Are you ocean surfing this weekend? Going on a day paddle in marginal conditions? The E-Tour is a hybrid semi-drytop combining the features of a whitewater drytop with a technical touring jacket. Waterproof and breathable Entrant fabric shell with latex wrist gaskets and double spray skirt tunnel keep you warm and dry. 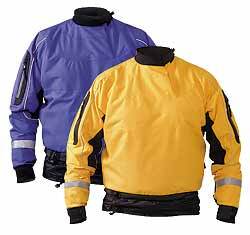 Reflective tape for safety and arm pockets w/ waterproof zippers for all of your accessories. Innovative stretch panels on shoulders and under arms for mobility.